Heigh-ho, more photographs. I fear these ones are a little geeky (not in a 'wow, awesome, whizzo-cool' geek sort of way; I'm thinking of the sort of geek who traps you in the corner at a party and says 'I think you'll find...' a lot). Offered without much in the way of apology or explanation. 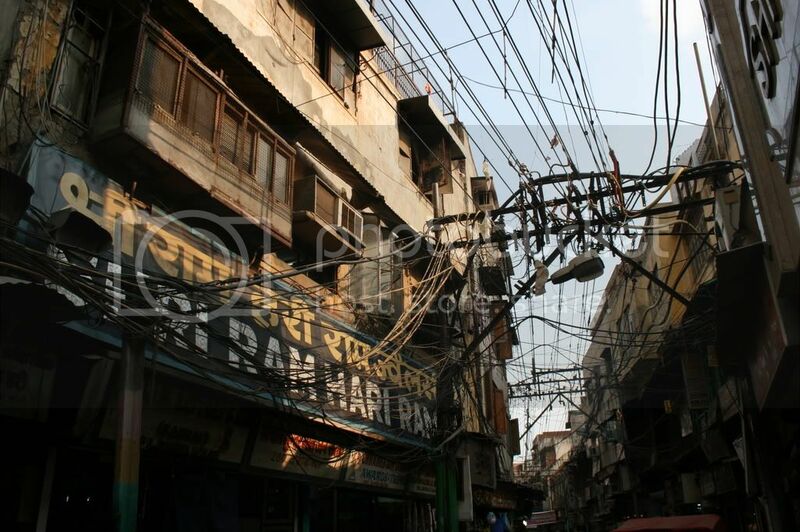 Although, if you want an explanation of why I'm posting a bunch of photos of overhead cables, one reason might be that it's one of the things that's different in an easy, first-impressions way around the world. Pylons and streetlights and toilets and breakfast and whatnot. And some of those things are easier and less embarrassing to photograph than others. Also, I find them strangely visually appealing, both as patterns of lines and as physical manifestations of invisible networks laid like a tangle of spiderweb over the globe, house to house and city to city; as if one could only hitch in a strong enough finger, pull and the whole world would unravel. I'm kind of fascinated by freight. Part of that is that I'm supposed to be modelling freight movements at work, and it's a bit of a bugger. Part of it is that nearly everything in this house has some sort of silent freight past; wrapped in plastic, traversing the shipping lanes or the motorways or the skies of the world. I often wonder what's in the shipping containers we pass on the road. Once I was at a conference where an Indian entrepreneur announced that it was economic to fly a cargo plane full of mangoes across the country regularly. That plane might be full of mangoes, I find myself thinking. When I see freighter aircraft that is. Not all the time. I passed two transshipment ports on my travels, so here they are. Port of Savannah, Georgia, September 2009. I'm a bit perplexed by the global variation in toilets, because some designs seem so much better than others. I suspect people like what they know; it was interesting to see a group of Chinese tourists in Beijing queueing for the toilets at the Summer Palace turning down empty cubicles containing Western-style loos with obvious disgust. Mmm, freight is very networksy, which pleases the work-bit of my brain. Counting cows is easier, though, as the government does all the work for me already. There's actually quite a lot of data on where freight goes out there (especially in the US) - the main problem is modelling which method it uses to go places (e.g. the amount of air freight from a city can depend quite strongly on exactly what sort of industries are in that city, whereas passenger numbers are typically more dependent on numbers which are more easily obtainable and well-defined). Plus freight switches modes at the drop of a hat, whereas passengers seem not to like being told "your flight to Edinburgh is very delayed, so you're going on a bus instead". And if air freight is anything like sea freight, there's plenty of data out there, but trying to find out which bits of the data are accurate is a whole other story. Not to mention ports trying to fiddle the figures so they can get more funding for their pet projects (there was a scandal about this in Korea last year). Um. I think I just turned into the geek in the corner. Sorry. The data we have for air freight is generally reasonably accurate, mainly because it's from the US and Europe and I've not looked into the rest of the world as much. Getting country, city and passenger data for the rest of the world was, um, interesting, though. Don't like several million of your country's inhabitants? Simple exclude them from the census! GDP too low in comparison with other countries? Alter the official exchange rates until you look like a rich country! Nyess. That's an excellent name for a veterinary music band - "Counting Cows"
It is important to give frogs electrical power. Otherwise their air conditioning breaks down and that makes them sad. What are Chinese toilets like then? Most weird things on high voltage lines are either vibration dampeners, or insulators for preventing "animal phase-to-ground bridging problems". I don't know which of those the concertina-y thing is for, if either. Typically squat ones. I can see why Western-style toilets might seem disgusting if you're used to squat toilets - there's no bodily contact involved in the latter. OH me no, these are fabulous. Powerlines are great, and so are ports. I can understand the reticence about western style toilets. I mean really, squat toilets are infinitely less ... intimate. Ah that answers my question - the Chinese use "hole in the ground" toilets. I'd never thought about the "intimacy" issue. I guess if you're used to a squat toilet then using a Western style toilet would be the equivalent of me entering a cubicle and finding a big pair of rubber wading pants that I was supposed to pull on and use - even if they were rinsed and sterilized after each use I'm not sure I could bring myself to use them. Mmm, those are serious cables. I wonder if, a few hundred years hence when having cables around has become an old thing (assuming cables and humans remain around that long) it'll all start being like trees growing over old walls; plants growing along them, and old wiring mixed in with new, and all the improvised uses to which people put things that have been around a few hundred years. Dude. You're my very first anonymous multilingual spam comment! It's like I'm finally in with the cool crowd. But I think my fingers couldn't stand the strain"
I recall the same feeling about pylons when I got the Eurostar into France - that and roadsigns, even when seen from the back. Yes, I remember being fascinated by the double-peaked pylons when I went to Paris - ISTR seeing double-peaked ones here more recently, but at the time they were a whole new exotic species. Apparently there's a field somewhere in Devon full of the full variety of pylon shapes and telegraph pole variants half-buried in the ground, for training the people who have to climb up them (and people from the British Antarctic Survey, hence my being told about it). Cool - sounds like a proper Google Earth treasure-hunt, that one (though it may be blacked out). Those are great! Very captivating. Nooo, I've been tempted by the bright lights of a different bit of academia. Currently employed by the Department of Architecture (yup, I'm not sure how that happened either) doing research on transport. And traveling a lot. I appreciate the giant robot dinosaurs of Vancouver, btw. They look as if they're just starting their long wade over the Pacific prior to taking down Tokyo.